The McConnell Center’s lecture series on American Political Culture concludes April 8 with a talk on what four foreigners observed during their travels in America. 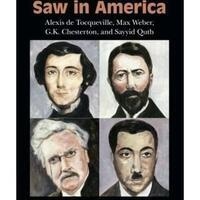 Dr. James Nolan, the Washington Gladden 1859 Professor of Sociology at Williams College, will discuss his popular book, What They Saw in America: Alexis de Tocqueville, Max Weber, G.K. Chesterton, and Sayyid Qutb (Cambridge University Press, 2016). Nolan’s research interests fall within general areas of law and society, culture, technology, social change, and historical comparative sociology. Directions & parking recommendations (link). We recommend parking in the Speed Art Garage (pay parking).